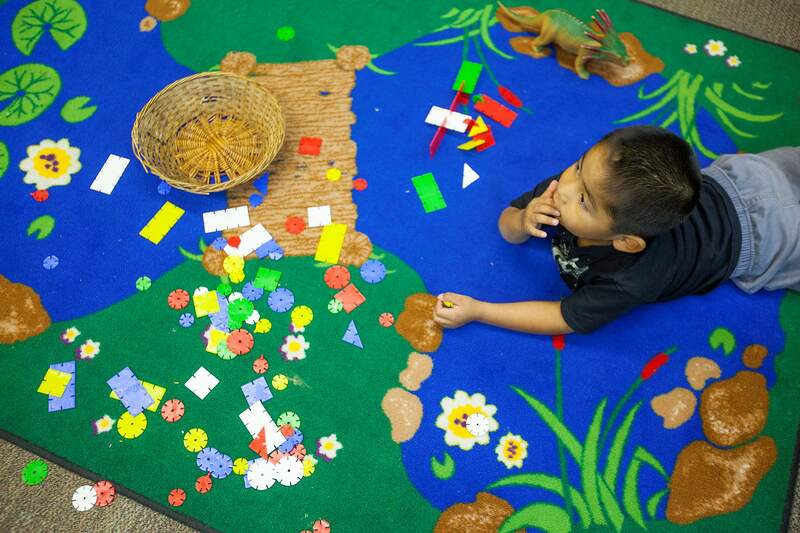 John Scott pauses between play and learning time in the 3- to 5-year-old class at Head Start in Ignacio on Monday. 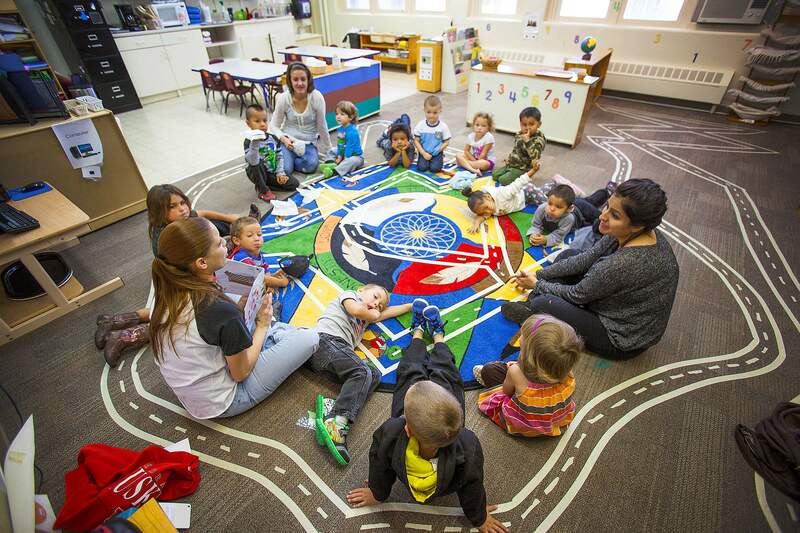 Combined with Early Head Start, the program serves about 190 children each year as part of the Southern Ute Community Action Programs, which turns 50 this year. Head Start instructor Amber Saiz holds Aiden Martinez, left and Reagan Toledo during play time for the 15-month to 3-year-old class at Head Start in Ignacio on Monday. Head Start is one of several programs the Southern Ute Community Action Programs. It helps fulfill the SUCAP’s commitment to total community development. A story read during “circle time” in a Head Start class in Ignacio on Monday has every students’ rapt attention. SUCAP, which runs the program, has a $7.4 million budget and 118 employees, making it one of the largest nonprofits in La Plata County. It began as part of President Lyndon Baines Johnson’s War on Poverty, and 50 years later, the nonprofit Southern Ute Community Action Programs has become an integral part of the Ignacio community, serving everyone from babies through seniors. Among SUCAP’s many programs are Head Start and Early Head Start, the Ignacio Senior Center, The Training Advantage, Peaceful Spirit Treatment Center, SUCAP Youth Services and Road Runner Transit. Each of those has subsidiary programs, SUCAP Executive Director Eileen Wasserbach said. She has been involved with SUCAP since 1983 – except for a five-year hiatus – and has been executive director since 2000. While the two Head Start programs serve about 190 children from 140 families each year, including providing transportation, the agency also includes parental advocacy, parenting training and developmental screening in its offerings as well as administering a child care assistance program for Native Americans in La Plata County and a child safety-seat program. For more than 200 seniors in Southeast La Plata County, SUCAP provides nutrition, transportation, information and recreation services. While youth services are relatively new, SUCAP operates Curiosity, an after-school program in the Ignacio School District, in addition to working with junior and senior high students to promote healthful lifestyles, including avoidance of drugs and alcohol. “Teen Court is operated in the Ignacio middle and high schools as a function of this program,” Wasserbach said. One of the early focuses of the nonprofit was training people and creating employment, Wasserbach said. An initial enterprises was a cucumber farm, with the harvest used to make pickles, “first pickle,” the organization’s scrapbook says proudly from that period. Training and providing workforce opportunities is still one of SUCAP’s principal programs. The Training Advantage, which assisted more than 1,800 people in 2015, operates in 17 Colorado counties in the Western, Southwest and Southwest regions with offices in Durango, Ignacio, Pagosa Springs, Cortez, Montrose, Delta and Gunnison. Taking the leadIt’s the many firsts in its inaugural five decades SUCAP can look back on with pride, Wasserbach said. All of Southwest Colorado can thank SUCAP for helping to found the Crossroads Center at Grandview, which serves as the detox unit for several counties. The nonprofit also helped found the first iteration of the Ignacio Public Library before there was a library district, a Teen Drop-In Center, an Even Start Family Literacy Program and a community fitness program in an old Army building that led to the SunUte Community Recreation Center. Community Action Programs were founded in 1964, and Ignacio was initially served by Southwest Community Action in Durango, Wasserbach said. The 26-mile difference made it difficult for the organization to serve Ignacio, so two years later, the Southern Ute Indian Tribe formed its own organization. Southern Ute Community Action Programs is celebrating its 50th anniversary with a party from 3 to 7 p.m. Friday. The event will feature music, food, a silent auction and family activities. Visit www.sucap.org to learn more about the organization.